We hope you come to enjoy this very special place as much as we have over the years! Two Cottages on 1.4 acres on a private wooded peninsula. All rentals include shared use of four kayaks, a canoe, a rowboat, and a paddleboat. Groups as large as 20 can be accommodated! Spectacular waterfront patio and large new dock. Unlimited swimming, boating, water sports, fishing. 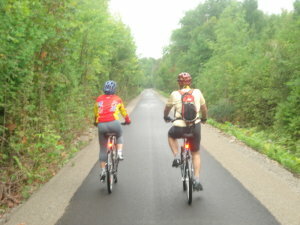 New nearby trails for cycling enthusiasts! In Cottage Country on Georgian Bay in the beautiful Huronia region of Southern Ontario, bordering the Muskoka region. 90 miles north of Toronto. Read what our guests say in their testimonials. Shared use of four kayaks, a canoe, a rowboat, and a paddleboat. Six bedrooms accommodating up to 13 guests. 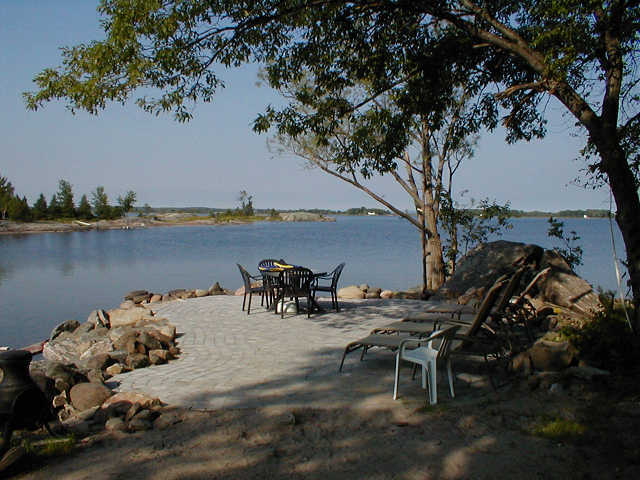 A Secluded west-facing deck at the water's edge. Ideal for sunsets! A sun porch with fabulous views. Three full bathrooms (one with Jacuzzi tub). A large charcoal barbecue grill. Three bedrooms accommodating up to 6 guests. A spacious new deck with bay view. Motorboat rental. 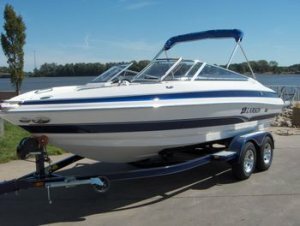 We have a 15HP motorboat for rent. The price is CDN$40 / US$40 for one day, or CDN$195 / US$195 for the entire week. 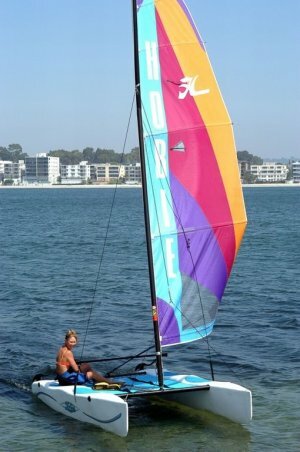 Hobie Wave Sailboat rental. We also have a Hobie Wave sailboat for rent, for great fun on the lake. The price is CDN$75 / US$75 for one day, or CDN$275 / US$275 for the entire week. Bicycle rentals. We have three touring bicycles with suspension for rent: a men's, a women's, and one suitable for a mid-sized kid or small adult. They rent for CDN$50 / US$50 per week each. Biking in the area is scenic and easily accessible, as on the Tay Shore Trail shown in the photo. 19' Lightning Sailboat weekly rental for qualified sailors. Please contact us for details.